Sarsen Technology is pleased to be exhibiting at the Embedded Design Show with our friends from DAVE Embedded Systems. Launched to fill a gap in the growing embedded electronics market, the Embedded Design Show will offer a focused event for the industry. This year the Embedded Design Show will be co-located with the Electronics Design Show and Engineering Design Show which will also incorporate Engineering Materials Live. Attendance to this event is free, so if you’d like to meet with the team and find out more about the technology from DAVE, including solutions featuring ARM Cortex CPUs & Xilinx Zynq SoCs, please get in touch to arrange a ticket. The new Condor 3001xF XMC graphics and video card from Tech Source is a rugged convection-cooled XMC graphics/video processor with 1GB of on-board memory, supporting the latest versions of APIs such as OpenGL, OpenCL and DirectX. Based on the AMD Radeon™ E6760 embedded graphics processing unit (GPU), the Condor 3001xF offers exceptional graphics performance. The built-in video decoder enables dual HD decoding of H.264, VC-1, MPEG4, and MPEG2 compressed video streams. 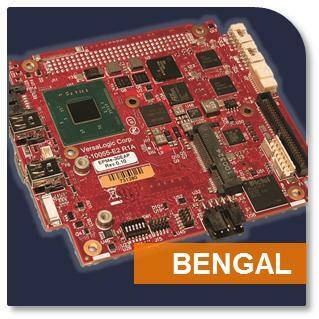 The BENGAL from VersaLogic is a brand new low power/high performance board based on the "PCIe/104 OneBank" format. The Bengal combines high performance, low power consumption, enhanced security and small size for an unbeatable combination in most applications. ZNYX Networks has received the Supplier Recognition Award from Lockheed Martin’s Aeronautics business, the world’s leading designer and manufacturer of high-performance combat, air mobility, and reconnaissance and surveillance aircraft. The award recognises ZNYX’s demonstrated commitment to excellence with 100 percent on-time delivery and quality of their network switching products to Lockheed Martin.